Kylie is a fellow Adelaidian blogger of Octavia and Vicky, she was actually the first of which I connected with. A random google search about a year ago lead me to a list of blogs, I clicked on hers and found her facebook page. She was asking her followers to share if they were parents, teachers or bloggers so I introduced myself as being all three! Kylie has offered great advice to me along the way and we hope to meet up in person soon. 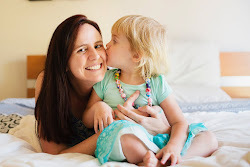 Kylie keeps busy with her two children, her teaching commitments and running various blogs. Welcome Kylie! I'm so pleased to have you here. 1. I love the story of how you came about your blog name. Would you mind sharing the story with my readers? When I in my first year at school I wrote a story called ‘Octavia and Vicky’. My mum always kept it and I loved looking at it over the years. For me it represents so much of what I love today – children’s literature, teaching, childhood, family and treasured memories. You’re welcome to read the original story on my blog. I’ve always loved writing and sharing stories. 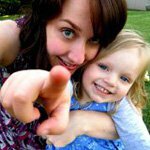 I’ve dabbled in blogging ever since I first had a computer in my hot little hands! Octavia and Vicky was created after I’d spent a couple of years writing a personal blog, with photos of my daughter and little bits and pieces about our day. I wanted to make a blog that was more professional but still had a personal touch. I went from Blogger to Wordpress and Octavia and Vicky was born! These days I’m teaching more and my blogging focus has shifted. I also write a class blog, maths journal, digital citizen ship blog and research journal. You can find them all here. 3. My readers may not know, what is an International Baccalaureate School? The school that I teach at is an authorizied International Baccaulreate (IB) school. The IB focuses on developing the whole child as a learner both in the classroom and beyond and has a strong global focus. My favourite thing about teaching in an IB school is using an inquiry method. Inquiry gives children the opportunity to develop deep understandings, higher order thinking and puts children’s questions at the centre of learning. 4. Favourite subject you teach? I’m not sure if I’d call it a subject, but inquiry is my favourite method of teaching. We use inquiry across the whole curriculum, maths, English, science etc. I love learning with children and supporting them to drive their own inquiries. I also love finding ways to use digital tools to support children’s learning and make global connections. Just recently we had some interesting chats with a class in New Zealand through our class blogs. 5. What activities are Pebble (5) and Rocky (2) loving at the moment? Pebble is a maker, she loves to create with anything and everything but especially boxes, paper, crayons, textas and sticky tape! We go through a LOT of sticky tape. Rocky loves anything outdoors and is a bit obsessed by cars and trains. 6. I’ll have a similar age gap to you with my second one comes along. Any parenting advice for me to prepare Miss M for the new arrival, or any tips on how to make life work with two kids? Have some independent activities ready for Miss M to do while you’re doing all those necessary (and lovely) baby things, like feeding. I made some busy bags for Pebble for those times. We also bought a present for Rocky to give to Pebble when he was born, which she played with at the hospital when she visited. 7. Do you have a favourite place in Adelaide to visit with the kids? We have some awesome local playgrounds that we love to visit. With Rocky being 2 ½ I love any playground that has a fence around the perimeter! Otherwise we like to try different places all the time and don’t stick to just one. This school holidays we’ll be visiting Monarto and the Central markets. Tea, white, no sugar. I’ve just recently discovered Turkish Apple tea which is delicious. No milk in that, though! Thank you so much Kylie! Lovely to have a fellow Adelaidian blogger here for the day! All the best with your teaching, blogging and of course parenting adventures! The personal story of a blogger meeting with another is interesting topic. Would you be kind enough to connect with me too.